Far more troubling, though, was its omission from the media release announcing the publication of the research. All perfectly valid points. But all of this was known, or could have been anticipated, prior to embarking on the research. So why bother with the project at all? As with last week’s media release, there’s considerably more to the story. Not that the media demonstrated any great interest in looking past the headline handed to them. Instead, they ran with it—which seems to have been the Hub’s intent. 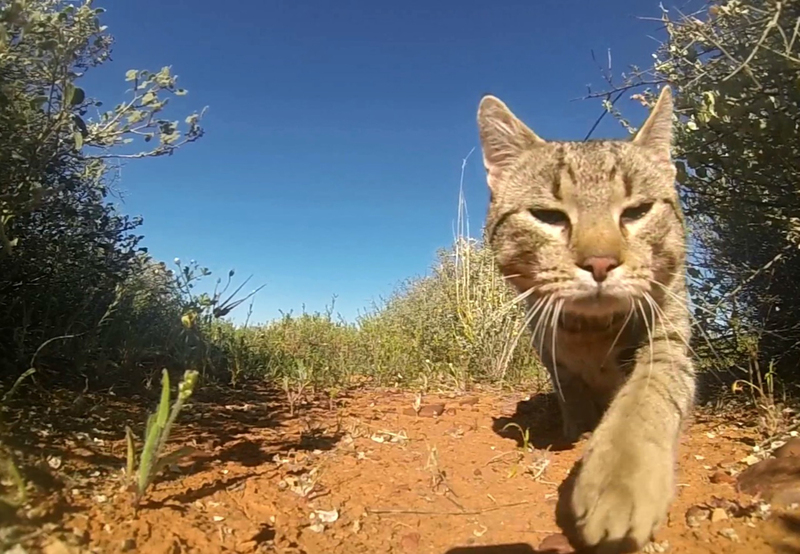 “Australia Has More Feral Cats Than Internet Coverage,” proclaimed Gizmodo Australia. And Smithsonian.com used the opportunity to once again vilify “fluffy murderbeasts” (as they’ve now dubbed domestic cats) and promote Cat Wars (about which the organization seems schizophrenic—eager to embrace it when it serves their purposes but unwilling to admit they played any role in its publication and promotion). But “cover” is, as it turns out, a relative term. Of the 91 data sources used by the researchers, half documented cat densities of 0.67 cats/square mile or less. That’s just two cats for every three square miles. Or about 127 cats “covering” Chicago (considerably fewer than the 182 Starbucks locations in the city). So, covered? Not so much. Meanwhile, arguably the project’s biggest take-away received remarkably little attention. According to lead-author Sarah Legge, the estimated number of Australia’s feral cats is now “between 2.1 million when times are lean, up to 6.3 million when widespread rain results in plenty of available prey”—far fewer than the previously suggested 20 million. One would imagine that these studies would have policy makers rethinking Australia’s War on Cats—with its price tag of $AU30 million and counting. Which is exactly the problem: such a move seems, sadly, relegated to our imaginations. Woinarski, J. C. Z.; Murphy, B. P.; Legge, S. M.; Garnett, S. T.; Lawes, M. J.; Comer, S.; Dickman, C. R.; Doherty, T. S.; Edwards, G.; Nankivell, A.; Paton, D.; Palmer, R.; Woolley, L. A. Biological Conservation 2017, 214 (Supplement C), 76–87. Kays, R. W.; DeWan, A. A. Animal Conservation 2004, 7 (3), 273–283. Loyd, K. A. T.; Hernandez, S. M.; Carroll, J. P.; Abernathy, K. J.; Marshall, G. J. Biological Conservation 2013, 160 (0), 183–189. 4George, W. The Wilson Bulletin 1974, 86 (4), 384–396. We should all know by now, that humans account for the biggest percentage of wild life destruction. The removal of habitats to build houses and unsupervised domestic animals, whether dogs or cats is all in the hands of the owner! Frankly, the numbers aren’t the issue. The fact is that feral and free roaming cats are an INVASIVE SPECIES and are spreading death and disease as they move about country. What in the world is wrong with setting up enclosures for captured feral cats??? What is wrong with cat owners who want their cats to go outside and setting up enclosures so their cats can’t roam? What is wrong with TAKING RESPONSIBILITY for these cats?? And I am speaking as a person who went to animal control to take home cats so they could live…IN my house, not outside roaming and predating. Any individual or organization that promotes TNR or other methods of dealing with feral cats while letting them remain outdoors is promoting the decline of native populations of birds and small animals and then the eventual EXTINCTION of same. So, let’s get real here. Cats do not belong in the environment killing native creatures anywhere in the US, or in the world. TNR is a “feel good” solution that solves nothing. Unbelievable $30 000 000 and counting!!!! Thank you Peter for your fact checking for the cats . I think the anti cat people were the originators of “fake news”. They are pros at it Please keep up your work for the cats, they and we need you so much! I hate what is happening here , I have moggies and doggiefaces and now I am not letting them out much to my disgust who are the sadists who want to kill out pets and the socalled ferals, I have trapped feral kittens now the biggest smooches one wishes to meet, patients is all that’s needed, chuck the sadists in jail were they belong or in a sanatorium for the insane, stop this insanity and the cat kill trap neuter[desex] and release will work , were is their brains are they all sitting on it? Thank you for this, I’m Australian and the current war on cats horrifies me. Don’t think for a moment the vilification is aimed solely at wild feral cats – it’s domestic pet cats, too. In fact, it’s mainly domestic pet cats for one very simple reason: there are very few people in the arid, so-called conservation areas where wild born feral cats actually are a major threat to native wildlife, so there aren’t many to witness what real feral cat predation looks like, there’s not much white civilisation or infrastructure out there, either, comparatively speaking. Most Australians live on a skinny strip on the east coast. The governments ( local, state and federal) can’t be bothered expending the resources to deal with the real threat, so they’ve turned it back on domestic pet cats. Their own cat predation maps bear this out: the threat’s where pet cats aren’t. If you look at the map, cat predation isn’t a problem on the Australian east coast- and guess where most of the people and their pet cats live? But blaming domestic pet cats makes it appear the government is doing something and it gives Australians other Australians to blame. We like blaming our neighbours and looking down our noses at them in Australia, makes us feel good about ourselves, morally righteous and superior. And of course, we can continue ignoring the land clearing to feed the housing bubble, the monoculture, the mining industry, the cattle and the sheep. How do the governments and the anti-cat warriors get away with this? Well, firstly they conflate feral cats with pet cats, all the time. The body of the articles the cat haters put out will be about feral cat predation, but it almost always will contain a paragraph saying pet cats kill native birds, too. 1. How many birds are there in Australia? Someone actually did ask Professor John Woinarski, one of the main spokesmen/”scholars” in the cat offensive this question. I think it was the ABC, but it doesn’t matter much. Nobody seemed to pick up on the significance of the answer – including the rest of the ABC, who’ve run with the 1 million birds a day bit ever since. Anyway, Woinarski reluctantly admitted nobody really knew how many birds there are in Australia , but a coarse estimate based on land bird density is 11 billion. He also reluctantly admitted nobody really knew how many feral cats there are in Australia either, and that his faction’s previous claim that there are 15 to 20 million feral cats was incorrect and it appears to be more like 1 to 2 million ( I note this article mentions another a brand new feral cat estimate of 2.1 to 6.3 million from Woinarski’s colleague, Sarah Legge – thank god human infrastructure is planned with more solid population estimates). Woinarski finally offered the statistic that based on current estimates, that 1 million native birds a day represents around 3 – 4% of the mortality rate of ALL native birds. Now that we have context, that 1 million birds a day looks a lot less horrifying, doesn’t it? You’d think this would be key, wouldn’t you? But it never rates a mention. Not ever. Why? Because this is about morals, not conservation: cat=bad, native bird=good, end of story. If they actually started breaking cat predation up by the bird species and its conservation status, the whole attack on cats – especially in the cities, towns and suburbs where the majority of people and cats actually live – would collapse. The emotive argument that we need to eradicate all cats and make owning one illegal because they kill native birds like sulphur crested cockatoos, rainbow lorikeets, galahs, eastern rosellas and noisy miner birds falls to the ground when you know the conservation status of all these birds is least concern. Indeed, the noisy miner bird is a major threat to many other native birds in some areas and the eastern rosella is, too. I imagine cats have a cheer squad of other native Australian birds when they kill noisy miners and eastern rosellas. But as I said, this is about morals, not conservation. Those birds are NATIVES, GODAMMIT! – and in the immortal words of the Prophet’s audience in The Life Of Brian, the birds are very pretty. Please don’t misunderstand me. I’m not saying feral cat predation in the arid areas of Australia isn’t a major threat to specific species in specific places. It is, and we must address it, just as we must address the threat posed by all invasive species that stifle threatened local native species- both introduced ones like cats, rats, foxes, rabbits, pigs, mynah birds (I’ve given up hoping cattle and sheep farming will ever be addressed, and I’ve had the Man From Snowy River quoted at me often enough by misty eyed horse lovers to know the wild brumbies must continue to run free and destroy the mountain country for everything else before dying a horrible, slow death from starvation in the cold, Winter snow) and native ones like noisy miners and eastern rosellas. Or kangaroos. Ever seen a roo plague? Thousands and thousands of sick, starving kangaroos? Apparently, a slow, painful death from starvation is humane but shooting them is barbaric: thou shalt not shoot Skippy. It’s immoral. The habitat loss that caused the kangaroo famine in the first place isn’t, of course. If it wasn’t for the habitat loss, the roos may have made it through the drought. Next drought, rinse and repeat. But we won’t talk about habitat loss – the number one threat to Australian wildlife everywhere- now galloping along faster than ever thanks to Australia’s real estate bubble. What would be the point? Like cattle, sheep, open cut mining and monoculture, people are making vast sums of money out of land clearing, so no one’s going to stop it. They’ll glare at the neighbour’s cat rather than look in the mirror, while rubbing their hands together at how much their house has appreciated in value, content to believe it had everything to do with their hard work and nothing to do with an artificial, criminally inflated market. Strange cattle, people. Starve roos and horses, bait cats, trap them in leg hold traps, do the same to canines, bait and trap many native animals as by catch, call a companion animal Auschwitz a shelter or refuge, give rabbits a disease so they go blind and starve to death, and call yourself a moral, ethical humane human being. For me, the way to address the issue of feral cat predation is TNR and a very careful reintroduction of the cat’s natural predators, because lethal culling of cats simply doesn’t work- the 70% rule kicks in. TNR on a national scale would basically be an engineered extinction event – fast enough to have a real impact, but slow enough to allow nature to transition from one apex predator to another. I say careful reintroduction of predators because the dingo is already the seventh biggest threat to native wildlife and I’m sure it would be higher if the dingo fence didn’t exist. If it happens, I can see suburban Australians complaining to local councils about wild dingoes roaming the streets posing a threat to children and they’d have a point: the dingoes around human campsites in the NT didn’t exactly run away from children – ask Azaria Chamberlain. The Tasmanian devil proposal is interesting, though I can see suburban Australians complaining to local councils about the noise. But we must concentrate on the real threat- the feral cats in the arid areas – not the cats in the suburbs of Sydney, Newcastle, Melbourne and Brisbane catching those plentiful species who are of least conservation concern just because the birds are natives, so perhaps TNR in the suburbs would be enough and we can leave the release of dingoes and devils for sparsely populated areas where the feral cat predation is a clear and present danger? What I believe will actually happen is nothing constructive. We’ll be seen to be doing something while really doing nothing and our success will be measured in dead cats- on tables and in the suburbs. Piles of ‘em, metres high. Or we would see them, if the heartwarmingly humane animal shelters didn’t cremate the evidence. The real problem won’t be addressed at all. Too many cattle in those areas to release dingoes, it’s too hot, arid and sparsely vegetated for a cool rainforest critter like the Tasmanian devil and screw spending money on TNR when nobody in the suburbs really cares about the native critters living in the outback anyway. Hell, they don’t even care about the people- Australia’s been treating First Australians living traditional lives with a mixture of nasty contempt, condescension and indifference for a very long time. If we won’t spend money to improve their health outcomes and living standards, does anyone honestly believe we’ll do it for non-human species? The only natives Australians care about is the ones in the backyard, and we only care about some of them- the pretty ones, the cute ones, the ones with pleasant songs, the ones we think are clean, the ones we think are peaceful, the ones we think are nice, ( rainbow lorikeet = good, corvid = bad; rainbow lorikeet= good, snake of any kind = bad) the ones that don’t annoy or irrationally frighten us- and the suburban moggie is a fine and handy scapegoat to blame for a lack of the critters we like. The anti-cat laws in the suburbs will get more draconian. Brisbane City Council’s already led the way demonstrating Australians have no problem seeing suburban cats caught in leg hold traps. Australians found it acceptable. If it was someone’s pet, tough luck – it’s a filthy murdering cat and it should have been locked inside the house, even if it was wearing a bell or one of those sonic collars. The owner was clearly irresponsible and didn’t deserve to get it back. It should have been put down, with all the other free range cats. They’re all feral. The only good cat is a dead cat. The only place for a cat is in a crab pot as bait. It probably belonged to one of those crazy cat women and they’ve all got that mental disease cats carry, so who cares what they think? It’s only a matter of time before it’s legal to leg hold trap, bait and kill a cat if you claim it was on your property. There’ll be a spate of cat baiting stories in the media, then they’ll stop because it’s commonplace and perfectly legal, so no one cares. And ultimately, it will be illegal to own a cat here and Australians will pat themselves on the back for saving Australia’s wildlife. They’ll point to the noisy miner birds in the back yard as proof of their success, just like they point to the absence of a snake* in their suburban backyard as proof snake deterrents work. And if a snake turns up tomorrow? Well, there would have been TWO snakes without the snake deterrent, wouldn’t there? The fact that they now need an additional snake deterrent to deal with all those snakes after all those arboreal rats the community cats used to take out turn up is an annoyance, but you can get snake deterrents cheap on ebay, and it’s worth it for the noisy miner birds, isn’t it? Aren’t they beautiful? Not at all like those horrible introduced mynah birds. Oh look! A gang of them just sent that little dull brownish bird away with a flea in its ear! It looked a little like a willy wagtail, but not cute and pretty and nice like a willy wagtail. I think I heard someone call it a wren once. Dull little bird. Not at all pretty. I’m glad the noisy miner birds got rid of it. And anyway, the council is considering proposals to cull the snakes. Nasty things, snakes. Not at all nice. *My attitude to snakes is the same as my attitude to suburban cats. They are not a problem. The neighbour had a red belly black snake in the yard the other day and I cheered: I’ll take a red belly over a brown snake any day and thank the red belly for keeping the brown snakes down. But then, I think snakes are beautiful. And I live in the suburbs. I lived in the suburbs of a town in the Queensland tropics for decades, now I’m living in the suburbs of a large city on the coast of NSW. I’ve always had cats in the house and birds in the yard. As far as I know, no cat of mine has ever killed a member of a threatened species, bird or animal, and they all liked to bring their trophies home. I never lived in proximity to threatened species cats prey on, either. The cats killed plenty of black rats, but they stopped when I started curfewing them years ago for their own protection. Humans are responsibile for more destruction of wildlife and the environment than cats ( rubbish, toxics, polution, wiping out forrest, hunting, the list goes on). Focus should be on humans cleaning up their mess and taking responsibilty. It’s not clear from your comment just what you think the solution is?